www.ascpskincare.com 27 expertadvice FEED YOUR FACE A Tomato a Day Lycopene, an antioxidant found in tomatoes, can protect your skin by Alex Caspero While keeping out of the sun, covering up, and wearing sunscreen are your best bets for protection against harmful rays, there is one line of defense you could be overlooking: a bowl of spaghetti with red sauce. 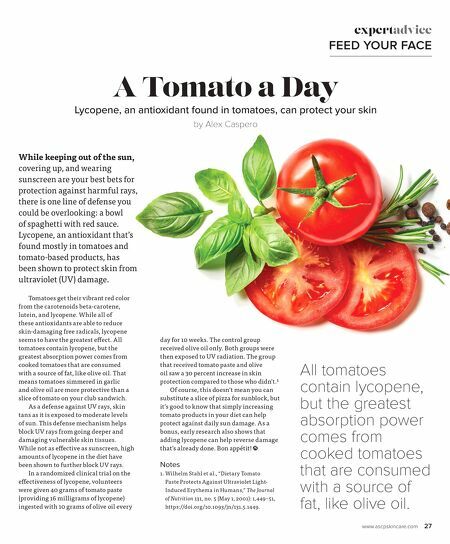 Lycopene, an antioxidant that's found mostly in tomatoes and tomato-based products, has been shown to protect skin from ultraviolet (UV) damage. Tomatoes get their vibrant red color from the carotenoids beta-carotene, lutein, and lycopene. While all of these antioxidants are able to reduce skin-damaging free radicals, lycopene seems to have the greatest eff ect. All tomatoes contain lycopene, but the greatest absorption power comes from cooked tomatoes that are consumed with a source of fat, like olive oil. That means tomatoes simmered in garlic and olive oil are more protective than a slice of tomato on your club sandwich. 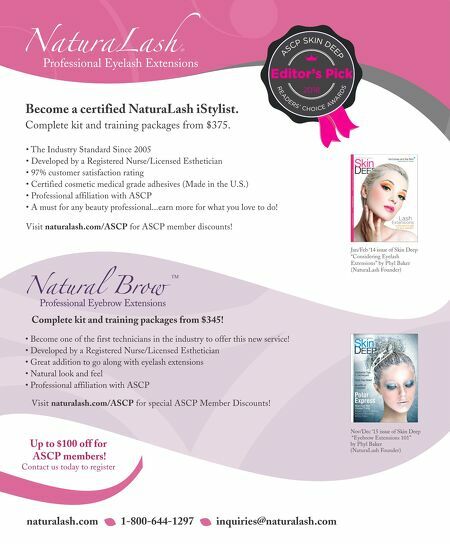 As a defense against UV rays, skin tans as it is exposed to moderate levels of sun. This defense mechanism helps block UV rays from going deeper and damaging vulnerable skin tissues. While not as eff ective as sunscreen, high amounts of lycopene in the diet have been shown to further block UV rays. In a randomized clinical trial on the eff ectiveness of lycopene, volunteers were given 40 grams of tomato paste (providing 16 milligrams of lycopene) ingested with 10 grams of olive oil every day for 10 weeks. The control group received olive oil only. Both groups were then exposed to UV radiation. The group that received tomato paste and olive oil saw a 30 percent increase in skin protection compared to those who didn't.1 Of course, this doesn't mean you can substitute a slice of pizza for sunblock, but it's good to know that simply increasing tomato products in your diet can help protect against daily sun damage. As a bonus, early research also shows that adding lycopene can help reverse damage that's already done. Bon appétit! Notes 1. Wilhelm Stahl et al., "Dietary Tomato Paste Protects Against Ultraviolet Light- Induced Erythema in Humans," The Journal of Nutrition 131, no. 5 (May 1, 2001): 1,449–51, https://doi.org/10.1093/jn/131.5.1449. All tomatoes contain lycopene, but the greatest absorption power comes from cooked tomatoes that are consumed with a source of fat, like olive oil.